Dress up your office with some beautiful leather file folders that are way more durable than standard paper file folders. Next time, you need to attend an important business meeting or attend an interview store your important documents in these DIY file folders as not only will they beautifully package your papers but they will also keep them from bending in your suitcase. Manage your living room clutter by organizing all your magazines that are overtaking your coffee table by storing them instead in a chic leather and wood magazine holder that would be perfect in your living room beside your sofa. Work on building your wine collection by storing your selected wine bottled in an industrial copper and leather wine rack. Perfect for a weekend project, you can build this wine rack inexpensively using copper tubing for the frame and a small piece of leather or leatherette fabric to hang over the tubes to support the wine bottles. Easily carry your yoga mat to your next yoga class by making a durable yoga mat strap using a strip of leather to wrap around either end of your yoga mat. Need a new clutch for your next cocktails night with the girls? Learn how to sew your fold over clutch using imitation leather in your favorite color with this straightforward guide by Say Yes that is perfect for anyone with some basic experience with a sewing machine. No one would be able to tell this DIY leather iPad case is handmade as it looks so professional with its sleek leather cover. If you are looking for a new cover for your iPad but do not want to spend too much on protecting this do it yourself project Almost Makes Perfect is certainly worth a try. 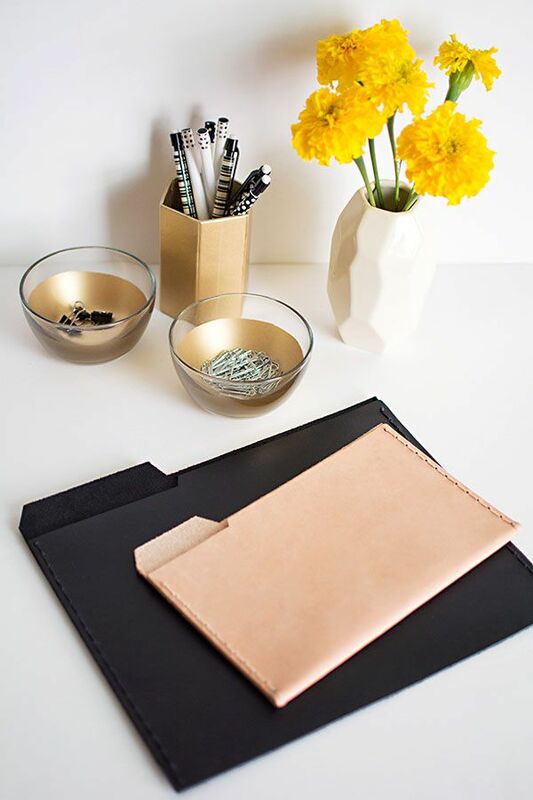 Ditch your old mousepad that you got at your last corporate retreat at work and make a super easy leather mouse pad in just a few minutes to dress up your desk as done by Earnest Home Co.
DIY Rose Gold Leather Mousepad from Earnest Home Co.
Organize all your makeup brushes, jewelry and other odds and ends on your vanity in a modern hexagon vanity tray that is lined with leather to give it a very luxurious finish. Get started on making your own leather vanity tray by reading the tutorial at Sugar And Cloth. Assemble your own leather pouch to protect and store small things in your bag such as money, bus passes, or makeup using the tutorial from Poppytalk. If you are looking for a unique gift for a man in your life, this stamped leather tie clip by Lovely Indeed can be customized with your own personalized message. If you are getting married soon and looking for the perfect groomsmen gifts make the guys some leather wrapped flasks to thank them for being part of your wedding. All the details you will need to learn how to wrap a flask with leather can be found at I Spy DIY. Next time, you throw back your hair into a quick ponytail or messy bun dress up your hair by adding your own handmade leather hair clip to add some extra style to your outfit. Learn how to make your own leather hair clips that will help keep your hair in place at A Beautiful Mess. Between toting your laptop to school, work and back home again, your computer is likely to get scratched in the process so make sure to protect it by making your own laptop sleeve. This do-it-yourself sleeve by Lovely Indeed is made out of gold leatherette making it durable and stylish, for a winning combination. Looking for the perfect casual but slightly edgy accessory to go along with your favorite pair of jeans and comfy t-shirt look no further. Make a studded leather bracelet to complete your casual outfit with this amazing studded leather bracelet tutorial from The Perfect Pear. Ditch all the to-do lists that are cluttering up your desk and instead make one beautiful dry erase board with a leather background as done by Fabric Paper Glue that you can use to write down all the things you need to do where you can easily see it on your desk. Next time you need to give a housewarming gift make these chic gold ombre leather coasters by Almost Makes Perfect to help protect someone's coffee table from water stains and add a bit of glam with the stylish gold detailing. This pillow with leather leaf accent would be perfect on your couch this fall. Discover how easy it is to add a leather leaf accent to a toss cushion over at Northstory. Baby shoes are expensive for something they only wear for a few weeks until they grow out of it, so learn how to make some booties for your child by downloading the template at Andrea's Notebook which you can use with your Cricut machine to cut out the leather boots and assemble them together with laces. It could not get any easier to make a pair of shoes.